Square gets a bigger office, embraces Canada and plans to double its staff. Also, PayPal Here, Isis, Apple and Google Wallet news. Square made a couple of big move announcements this week. First, the company literally will move to a new office space in the Central Market area of San Francisco by mid-2013, according to a report by Leena Rao at TechCrunch. Rao notes that the company has grown to more than 400 employees and reports Square plans to expand its staff to almost 1,000 people before the end of 2013. Square also announced this week that its service is now available in Canada, at the same 2.75% rate it charges in the U.S., according to a report by Ingrid Lunden at TechCrunch. Lunden reports one of the obstacles for Square in Canadian as well as European markets is that its dongle depends on the magnetic stripe on the backs of credit cards; many credit card processes in these markets use a chip-and-pin system instead. The obstacle isn’t insurmountable, however, as Lunden notes, Square’s partnership with Starbucks to incorporate its Pay With Square app service as a mode of payment might pave the way forward with retailers in other markets, making the card processing format irrelevant. Square competitor PayPal Here was on the move this week as well — into retail shopping. Rao reports in a separate post at TechCrunch that PayPal CEO John Donahoe announced a U.S. retail deal with AT&T during eBay’s earning call this week. PayPal Here previously had a retail presence only in Japan with Softbank. Rao reports that Here will retail for $15, with the purchaser receiving a $15 discount upon signing up; Square is sold in 20,000 outlets in the U.S. and sells for $10, with a $10 purchaser sign-up discount, Rao reports. Google gears up to compete with Apple, a look at the effect of technology on currency, and a wallet competition roundup. Dua said they plan for the Wallet to hold credit cards, loyalty cards, IDs and things like boarding passes and transit passes. Very much like Apple’s description of Passbook. Google responds to Wallet concerns, Buck enters the one-click fray, and Adele snubs freeloaders. 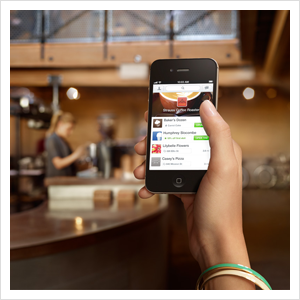 Mobile payment fragmentation, swipe-and-pay lives up to its name, and Starbucks plays with augmented reality. Google boosts Wallet's capabilities while PayPal powers eBay's earnings. Google Wallet launches on the Nexus 4G, consumers not yet interested in mobile payment, and a new look at Android users. Owners of Samsung&apos;s Nexus 4G on Sprint are the first to get Google&apos;s NFC-powered mobile wallet. Also, a new survey finds most Americans don&apos;t want mobile payment (yet), and a new batch of insights on Android users.